Looking at some of the computer models and it appears they are trying to take the surface low further south. This could mean a little snow further south. Don't expect the rain we are currently having to change over anytime soon. 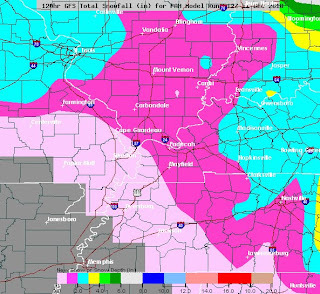 It's the wrap around precipitation that will bring us the chance for some snow. 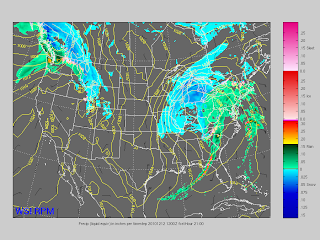 Take a look at our hi-resolution model (the same model we show as Precisioncast on the air). 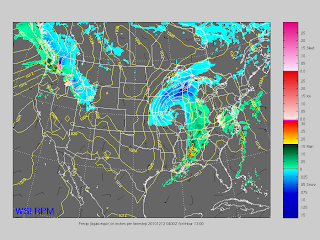 Here is the depiction of pressure, winds, and precipitation at 10pm Saturday. We will get dry slotted for a little while this afternoon and evening. When the rain moves out shortly from now, don't think the storm has passed and say, "This is all we're going to get?!" Here comes the wrap around moisture and in this case, snow. 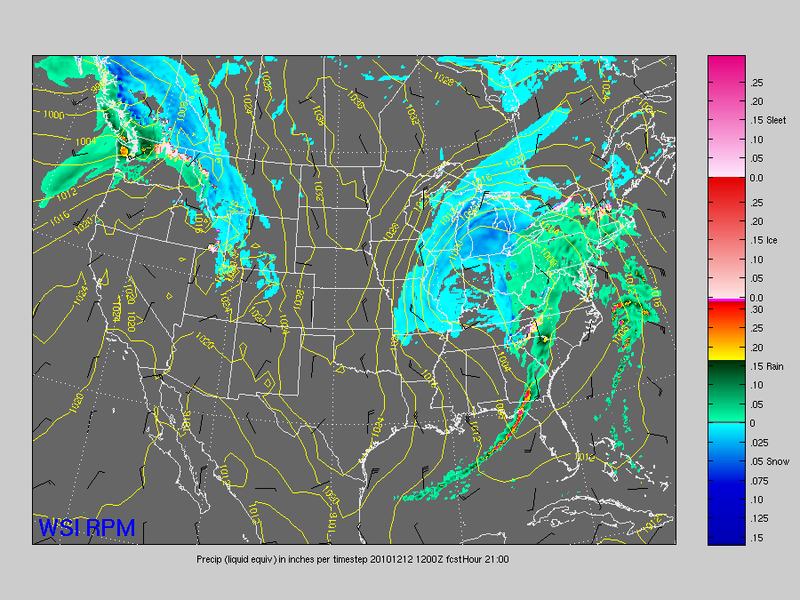 According to this model, the precipitation will start to move back in around 3:00am to 5:00am Sunday. For the snow lovers, I wouldn't get too excited just yet over this. There will not be a lot of moisture for the cold air to work with. However, what falls should be fluffy and will look neat as it falls. Here's a look at two computer model snowfall maps. I want to stress that this is just a computer simulation and not an absolute of what will happen. In general, the models are putting down around one inch of snow for most of southern Illinois and parts of western Kentucky with lesser amounts over southeast Missouri and Tennessee. 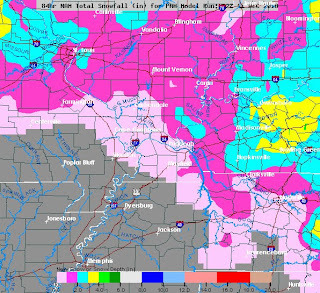 Something to notice with the two snow output maps above. The Global Forecast model, the GFS, has more of a broader, smoothed out look and the NAM has more little fine details. 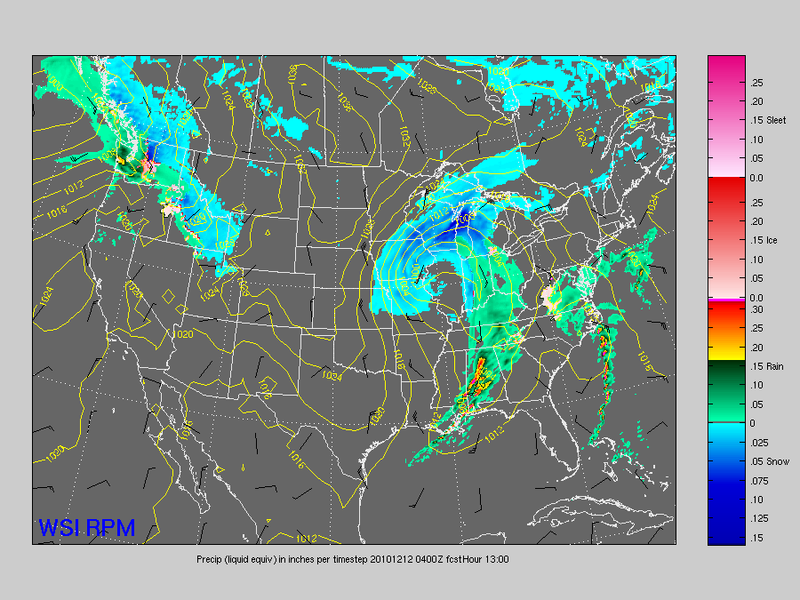 That is because the NAM is a higher resolution model than the GFS. See you on the television for Heartland News at 6pm, 9pm, and 10pm.